China Express will be closed on Mondays. (No. 1) Fried Rice & Egg Roll plus Ice Tea. (No. 2) Fried Rice & Cheese Wonton plus Ice Tea. 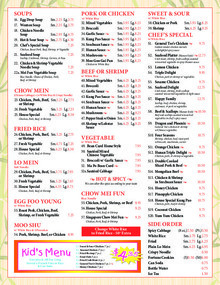 Change Egg Roll to Wonton Soup, Egg Drop Soup or Hot & Sour Soup only $1.00 extra. Change rice to noodles $1.50 extra. Monday-Saturday • 10:30 a.m.-3:00 p.m.
Crab meat, jumbo shrimp, fresh scallops sauteed w. assorted vegetable in spicy Hunan sauce. Shrimp, chicken, beef, roast pork, w. broccoli, mushroom, carrot. 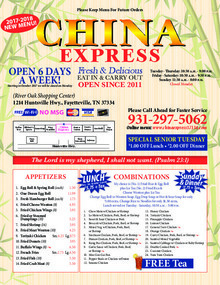 Download "China Express front e-0001-3517.pdf"
Download "China Express back e-0001-3517.pdf"